Norfolk Island Pines we see everywhere as ornamental trees across Australia, marking street corners and avenues with architectural conical features, caricatures of trees as if someone had drawn them. 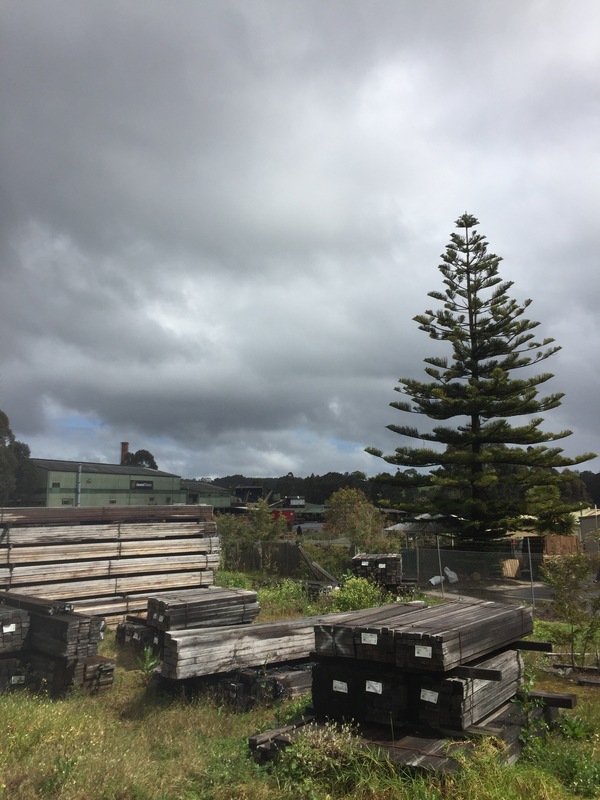 In the picture above, the Pine sits defiantly in the foreground of Pemberton’s saw mill which was originally set up in 1913 to harvest hard woods from the Karri and Jarrah forests to provide timber sleepers for Australia’s transcontinental railway. The line needed approximately 1.4 million sleepers to carry the rails across the country. The mill still operates and we were fortunate enough to catch a guided tour whilst raw logs were being processed for timber. Our guide had worked in mills all his life and was able to give us both a history of logging and a guide to the timber processing we witnessed. Visits to factories and places of production are always interesting, different from many contemporary places of work, as things are actually being made, sorted or being put together. The mill was no different. Progressing along an elevated walkway above the band saws, rotary saws, planers, separators, and flat bed conveyors moving differing sizes of logs and then timbers through the mill, we could see everything. We wore high visibility vests, eye protection, hard hats and ear protectors as otherwise the noise of the machinery would have been deafening. We were surprised to learn that only about 40% of a harvested tree can actually be used for it’s timber. Having seen the massive Karri and Jarrah trees in the forest this was depressing that such tall and elegant trees could be so ‘wasted’. The Karri can grow as high as 80 metres and is one of the Earth’s largest living organisms. Feelings of depression were to increase when our tour party was told that most of the timber currently in production at the mill, that we were seeing, was for tiling battens for the roofs of old houses in eastern Australia. Apparently these roofs are failing as they were originally battened with Pinewoods that are not as long lasting as the Karri and Jarrah which, as they age, become harder. The battens are 32 x 50mm. It’s like making match sticks from a European Oak.